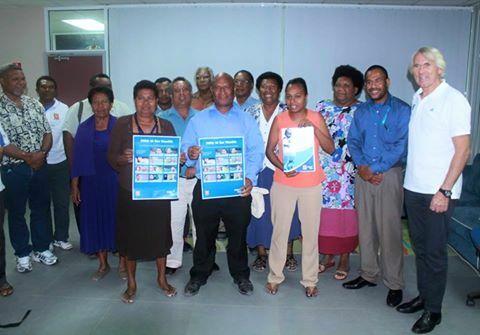 INSTRUCTIONAL courses for 32 Physical Education (PE) teachers that will be implementing the “FIFA 11 for Health” programme is scheduled for early next month in Port Moresby. Representatives from the FIFA/F-MARC group will be conducting the training for the 32 teachers who are from 16 schools within the National Capital District that have been selected to implement the program before it is rolled out into the other provinces next year. The FIFA 11 for Health programme targets 11 to 12 year-olds and compliments the OFC’s “Just Play” programme, which targets six- to eight-year-olds. The programme is a series of football based sessions aimed at encouraging physical activity and educating children about healthy behaviours related to some of the world’s health problems. The program is based on 11 simple messages that will help to reduce the level of communicable and non-communicable health problems or diseases. The 11 key messages are: play football, respect girls and women, protect yourself from HIV and TB, avoid drugs and alcohol, use treated bed nets, wash your hands, drink clean water, eat a balanced diet, get vaccinated, take your prescribed medication and fair play. The program is comprised of eleven, 90- minute sessions: each session consist of two 45-minute halves. The first half is called ‘Play Football’ and focuses on teaching young people skills related to specific aspect of football. The second half is called ‘Play Fair’ and focuses on teaching young people about a particular health issue and helping them to learn healthy behaviours. FIFA’s Chief Medical Officer Professor JiříDvořák visited the country in March and then last month where he met with the head teachers of the 16 schools and announced the roll-out plan of the “FIFA 11 for Health”. The programme is managed by the Papua New Guinea Football Association who will see the implementation of the program through its Social Responsibility programing unit. After the training, the 32 P.E teachers will then roll out the 11-week program within their respective schools,with the first certificates to be presented to the students during the FIFA U-20 Women’s World Cup in November. The FIFA U-20 Women’s World Cup will be held from 13 November to 3 December 2016. Caption: FIFA’s Chief Medical Officer Professor Jiří Dvořák with the head teachers of the 16 schools during his visit last month.